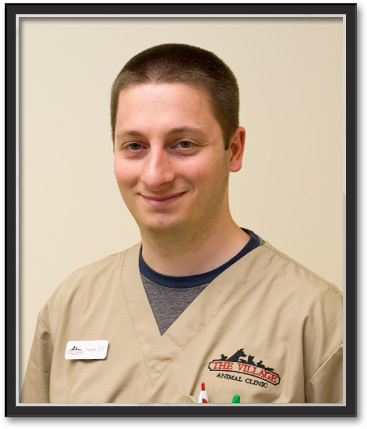 Joe is both the practice manager and a licensed licensed veterinary technician at The Village Animal Clinic. He received his veterinary technician training at the State University of New York at Delhi in 2001 and then earned his bachelor's degree in computer science in 2004. His expertise in both fields makes him a very valuable and essential member of our team. As a child, Joe loved to ride horses. He also was strongly influenced by his love for his German shepherd, Tanya, who he feels helped raise him. Tanya's constant affection and devotion earned her a permanent place in Joe's memory. "My life course was set," he says, "when I accepted the opportunity to shadow Dr. Cheever in 9th grade. That one day led to my regular volunteering with her and I found that working with animals and helping to heal them was enormously appealing to me." When The Village Animal Clinic opened in 2010, Joe was a natural choice to join our veterinary team. Outside of the office, Joe spends time with his wife, Paige, their adorable daughters, Lena and Ivy, and their bichon frise, Fluffy. He enjoys martial arts and is currently training in Tai Chi. He also likes to create and paint Warhammer miniatures, spend time at his grandparents' Lake Champlain camp, and do all his own home improvements. Having grown up amidst the beautiful Adirondack Mountains, Head Licensed Veterinary Technician Joan is a natural wildlife enthusiast. Her profession serves as an outlet for her lifelong love of animals and her interest in medical science. She uses her skills and her sense of humor daily to perform her job responsibilities, which include assisting the veterinarians, providing superior nursing care to the pets, monitoring pets during surgical procedures, performing dental cleanings and extractions, and always treating the animals with a gentle touch. Joan began working with horses when she was 11 years old and learned the details of proper husbandry, grooming, handling, and English equitation. Joan earned her licensed veterinary technology degree from the State University of New York at Delhi and obtained her license in 1997. Because she grew up in the mountains, Joan is an avid and experienced downhill skier, snowmobiler, and hiker. "I consider my passion for the outdoors to be one of my greatest gifts and I escape to the wilderness whenever possible," she says. It is not only the mountains that attract her interest but also her love of lakes; she is a certified New York State diving instructor. In her personal time, she also enjoys Moto Grand Prix racing, cars, music, video games, and Greek culture, which reflects her family's heritage. She shares her time with her partner, Steve. With her positive attitude, creativity, and strong work ethic, our licensed veterinary technician, Amber, contributes a great deal to The Village Animal Clinic staff. 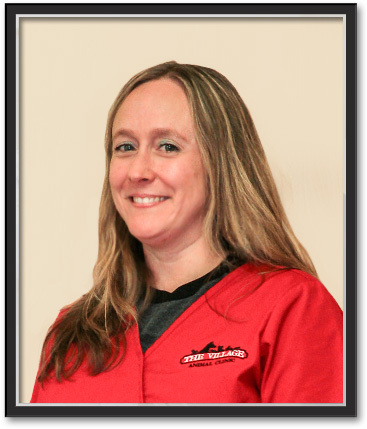 She brings with her not just her enjoyable personality but also years of experience from previous positions at Agway and other veterinary hospitals. Her responsibilities at our clinic include providing quality nursing care to the pets, processing blood work, performing laboratory diagnostic tests, and monitoring anesthesia during surgeries. 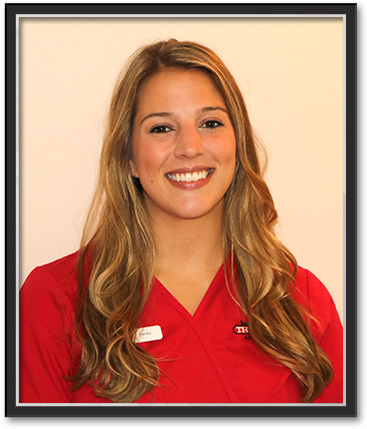 Amber earned her associate's degree from the State University of New York at Delhi in veterinary science technology and joined our team in August 2012. "I enjoy working at The Village Animal Clinic because my co-workers and I share the same high morals and ethics regarding pet care," Amber says. Amber not only gets a great deal of experience taking care of pets at our clinic but also at her home where she lives with 15 animal friends. Her love for creatures knows no bounds and she cares for two dogs, four cats, two horses, two gerbils, three ducks, one chicken, and one rooster. She enjoys training Ariel, her shepherd/husky mix for obedience, agility, and for her work as a therapy dog. Amber is also a member of the New York State Association of Veterinary Technicians. When she is not caring for animals either at work or at home, Amber can be found hiking, horseback riding, kayaking, camping, running, dog training, playing basketball, practicing her photography, or spending time with her family and boyfriend. 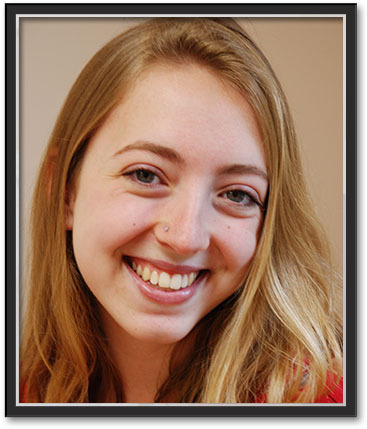 Jill came to our practice first as a student from SUNY Delhi’s Veterinary Science Technology program since she needed an opportunity for an externship to put her scientific and medical skills into action and perfect her skills. We appreciated Jill immediately and were very impressed by her advanced abilities while still a student learning the ropes. We also loved how easily and quickly she bonded with all of our staff. Upon her graduation with an A.A.S. degree in 2014, we sought each other out, offered her a job, and have been counting our lucky stars ever since that we found such a high-caliber technician; Jill is grateful to have found a practice with such high standards of medical expertise and care, where compassion for our patients is our number-one concern. Her path to her current profession was not a straight one: she entered RPI as an engineering student after high school, but realized that that was not where her passion lay and went to work at the Mohawk & Hudson Humane Society instead. At MMHS Jill quickly realized that working with, saving, and advocating for animals were her true passions, and after two years, she entered Delhi’s technician training program in order to give herself a greater skill set to help animals. Currently, Jill shares her home with Reba, an endearing Beagle mix. Fortunately for Reba, Jill’s many outdoor pursuits (hiking, mountain biking, skiing, stand-up paddle-boarding, and camping) all include Reba’s presence. However, Reba declines to join Jill in her other passion which is attending live music concerts—she shares her human’s taste in music, but dislikes the volume. We look forward to a long future with Jill and greatly appreciate her expertise. Tracy started her pursuit of a rewarding career by obtaining a degree as a legal assistant, but found that her interest in animals pulled her instead toward a career working with animals in a veterinary practice. She especially enjoys the challenges she faces when working with a wide range of exotic animals; she has developed superb skills in handling species that most humans never get to experience in such a way as to keep them safe and secure for their examinations by Dr. McCarthy. She has assisted both Dr. Mike and Dr. Holly for 14 years; they are both very grateful for her animal-calming skills and her quick wits as she keeps the doctors safe from their patients' efforts to rebuff them, and (even more important) as she keeps patients safe from their own attempts to wriggle away. Of all the species that Tracy handles with her consummate skill, she is particularly fond of cats, and, having recently lost her beloved feline companion of 18 years, she now is searching for the next cat(s) on whom to lavish her kitty-loving skills and affection. Tracy's favorite relaxation and enjoyment activities include cooking, swimming, and watching baseball as an avid New York Yankees fan. Given the opportunity, she would prefer to do any of these activities in New Orleans or Key West. 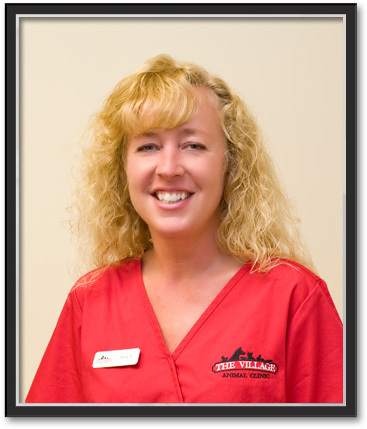 Dr. Mike and Dr. Holly are very grateful that she is willing to live instead in the Guilderland-Voorheesville area, where they enjoy her humor, her tireless work ethic, and her willingness to help them do their job as doctors to patients who want nothing to do with veterinarians. Our clients are fortunate to have her handle their companions with such professional expertise. Kailyn comes to us from a family with many pets of unusual species. Her mother in particular exemplified a humane concern for homeless and injured animals, so Kailyn has had a lifetime exposure to nursing animals in need of care and helping them to find a “forever home”—often with her own family. 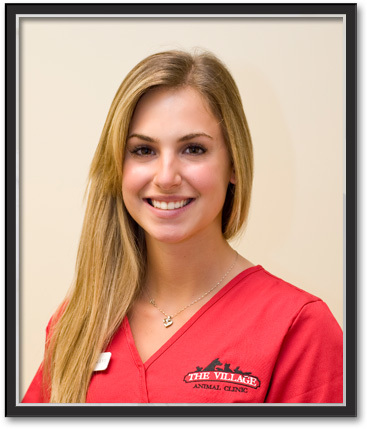 At our clinic, she is a veterinary assistant, which is her favorite role in our clinic team. Thus, she not only holds animals for veterinary examinations and procedures, but also provides very gentle nursing care for your pets who spend the day with us to reassure them and make sure their needs are met, from administering medications to fluffing up their blankets for comfort. Kailyn has an Associate Degree in Science from Hudson Valley Community College. She has had extensive exposure to dogs, cats, chickens, and horses through her family, and is eager to learn about the other exotic species who come to us: she is always asking her colleagues and the doctors to explain the nature of their illnesses and their proper care. She also is very eager to educate and to communicate with clients whose interest in animals equals her own. Her coworkers appreciate her high energy and her willingness to help anyone needing an extra hand. Cheyenne is an “unsung hero” at the Village Animal Clinic since her duties include activities that most people do not enjoy (such as removing stool from the grounds outdoors and cleaning the “accidents” within) and a lot of housekeeping chores. No matter what she does in the performance of her duties, she is always cheerful, humorous, and very kind to our patients who spend the day with us. She walks our canine friends and permits them some time to smell the flowers so that their days seem less irksome, and assists the doctors and technicians when the patients need an extra pair of hands and a friendly supportive hug. Cheyenne is attending Hudson Valley Community College and therefore works part-time. She always arrives for her shift with a very bright and cheerful attitude, which truly makes our day. We can attest to her scholarly mind since she is curious about every procedure that we perform and asks us myriad questions to enhance her animal knowledge. In her spare time, she plays with her beloved dog Abel; they enjoy nature walks together and spending time with her boyfriend at his family’s home on Sacandaga Lake. Although they are many years apart (48) in age as the oldest and youngest members of our staff, Dr. Cheever and Cheyenne share identical taste in music—folk rock from the 1960’s and ‘70’s—another example of Cheyenne’s superb good sense! Danielle and Drs. Holly and Mike go way back…we all worked together at a previous Capital Region veterinary practice many years ago, and thus were delighted when Danielle became available to join us again. Danielle combines many long years of experience in the field of client relations with an extensive background in animal care of many species. She received an A.A.S. degree in equine studies and business from SUNY Cobleskill, and managed a horse boarding facility while riding and competing at the intercollegiate level. Currently, she has two Thoroughbreds, a beloved Irishdoodle dog, one Savannah cat, and 2 chinchillas. Therefore, when she answers your questions about your own pets, she know what she is talking about! Danielle’s skills in managing our front desk are superlative. Her natural love of animals and her long-term experience in working in veterinary practices and also human medical facilities (orthopedic and chiropractic) give her an admirable understanding of what your companion animal (and you) are going through when injuries and illnesses occur. She can soothe and sympathize with you as your animal goes through treatments, feeling your pain as if it were her own. She also is admirable in handling your concerns, managing traffic flow, and she is particularly gifted in sharing your grief and offering her warm consolation when your pet’s health declines. She loves to see your new cuties when a new pet joins your family, and does what she can to make your visit stress-free. Danielle’s hobbies include “everything Disney & Disney World,” archery, target shooting, baking, and enjoying her fuzzy family members with her husband Paul. As a child, Erin spent many hours rescuing homeless kittens, injured wild animals, and stray dogs. 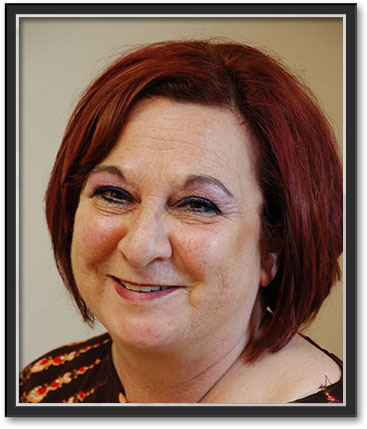 Her compassionate nature made her eager to help any troubled animal and she now directs that same nurturing trait toward our clients and their pets. 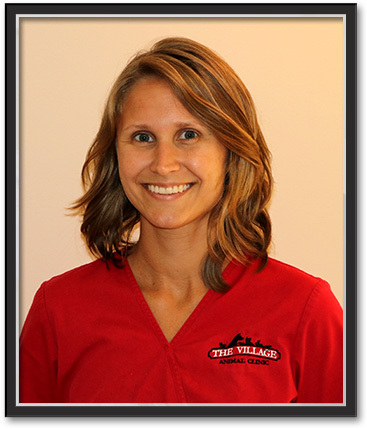 With her warm, welcoming manner, her ability to efficiently juggle scheduling issues, and her natural affinity for lending practical advice, Erin is a perfect receptionist for The Village Animal Clinic. Having worked in a previous practice with Drs. 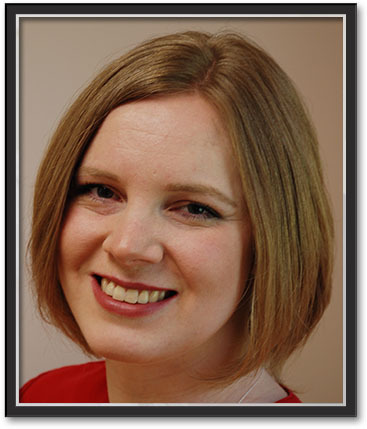 Cheever and McCarthy, Erin was happy to rejoin them when they opened their new clinic. 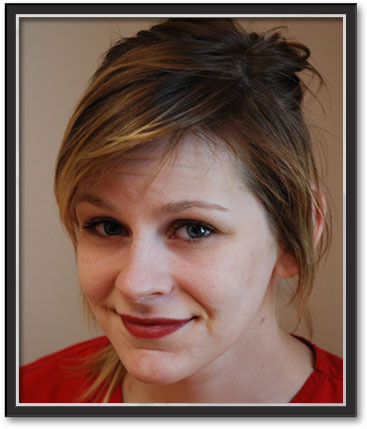 Erin is an avid New York Yankees fan and an outdoorswoman. She particularly likes to be near lakes and the Cape Cod and Saratoga Springs regions. She enjoys spending time with children and always keeps a fresh supply of coloring books and stickers available for our youngest pet owners. Erin shares her home and time with her husband Jim, their sons Logan and Gabriel, her Amazon parrot Miss Merlot, and her Siamese cat. Roxanne staffs our reception area in the afternoons, just when our Client Relation team is ready for the addition of her energy and good humor. She is always enthusiastic and cheery, and her smile adds warmth to her greetings as she welcomes our guests into the Clinic for their pets’ appointments. 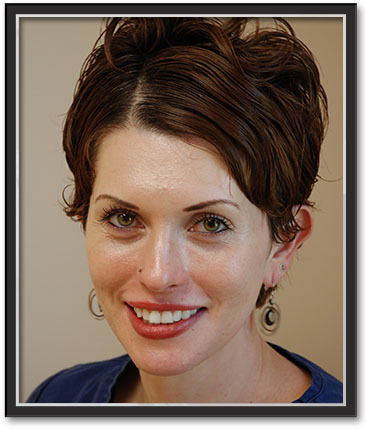 She performs a wide range of clerical and organizational duties that are essential to keep the Clinic running smoothly, yet is still able to carry on conversations and entertain our guests in the two waiting rooms at the same time. Like all of our staff, Roxanne is an animal lover, and shares her home with a cockapoo (Cocoa Puff) and 2 cats, Spitty and Elliot. She feels very much at home with all our staff members due to our all being animal lovers who want to make each pet’s experience with us a positive one—or at least to try! In her spare time, Roxanne enjoys cruising through flea markets and garage sales; she also loves boating and going to the movies. Free spirit that she is, the best times for her are spent driving in her car with no destination in mind. 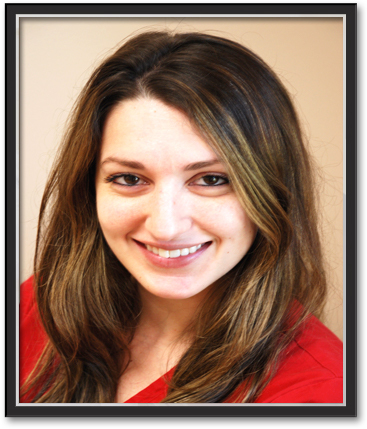 Callye is a member of our client relations team who loves the interactions she has with both our clients and patients. Clients provide enjoyment by swapping animal stores with the reception staff while awaiting their turn in the waiting rooms, and their companions are adorable and highly entertaining visitors. 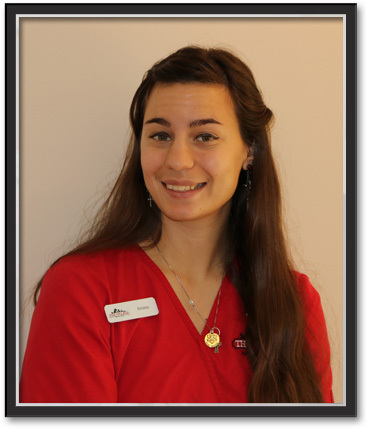 With her passion for learning and her fundamental fondness for all animals, Callye fits right in with our clinic staff and our philosophies. She particularly appreciates the Village Animal Clinic’s involvement with our community: we have fundraisers for local shelters, participate in Voorheesville’s annual Memorial Day Parade with a float that always gets rave reviews, and serve as mentors for any person interested in veterinary medicine as long as they are 13 and older. She specifically appreciates how empathetic all of our doctors and staff are with the wide range of animals that we treat. Callye has a collection of beloved family pets that is a bit out of the ordinary. In addition to three dogs and two cats, she also has four ball pythons and an assortment of Australian Blue Phase Tree Frogs. Since we treat a large proportion of the Capital Region’s exotic pets, her familiarity with reptiles and amphibians makes her a useful resource at our front desk. In her spare time, Callye enjoys hiking with her boyfriend and spending time with her family at their camp in Coldbrook, where she spends the most of her time outdoors, enjoying the opportunity to practice target shooting and escaping from the intrusion of constant cell phone calls. The Village Animal Clinic has been blessed to have an expert groomer added to our staff. When Emily joined us in 2016, she brought with her a service that provides a wealth of benefits to our patients (dogs and cats only, please!) and their owners. If your pet has a dermatological condition, Emily can address it with the correct choice of therapeutic shampoos. If it is a matter of aesthetic enhancement, she will make your pet look fantastic, keeping your need to constantly clean up shedding fur to a minimum. We can even offer owners the simplification of having their pet’s routine physical examination and vaccinations done while waiting for their turn to be groomed, making pet care a bit easier in your busy lives. For Emily, after her eight years of working with PetSmart as their salon manager, she has been delighted to create her own business, bathing and grooming her charges as she wishes, rather than following less creative company protocols. She limits the numbers of pets she grooms daily so that her nook in our clinic is always quiet and restful. Emily’s coworkers are amazed by her ability to manage a fractious cat or rambunctious dog so smoothly and gently, and we all love to see the owners’ delighted faces when their pet comes out looking so well. Emily has a handsome chocolate lab named Titan who is proud to show off his tricks to new friends. He also loves all the things that Emily loves in her free time, namely hiking, swimming, boating, and even snowmobiling as long as Mom goes slowly. However, he is not permitted to play on Emily’s year-round volleyball team (he is disrespectful of bouncing balls!) Emily has been a great fit for us: she appreciates working in an atmosphere in which animals are treated with such respect and compassion, and we appreciate her willingness to lend a hand whenever needed.